Autodesk Building Design Suite Ultimate 2016 is a collection of Autodesk applications designed to meet specific needs of technical designers creating projects for engineering, building and civil infrastructure architecture and construction industries. All the components of the Suite meet the international standards of industries. The Ultimate Suite is created for experts requiring BIM power and advanced collection of tools for designing and constructing. The Ultimate edition offers the complete toolkit of Autodesk products including essential Robots Structural Analysis Professional 2016, workflow enhancing Navisworks Manage 2016 and 2015 release of Inventor. These components make the Suite Ultimate 2016 release different from Premium one. AutoCAD – the software for speeding the documentation flow, sharing and collaborating on ideas as well as for exploration of 3D elements and concepts with comprehensive documentation and design tools. AutoCAD Architecture application – is a specific add-on for professional architects to provide a set of powerful tools for creating buildings and civil infrastructure. AutoCAD Autodesk MEP – is a specific software product providing a set of tools for professional mechanical, electrical and plumbing engineering. Showcase – this component will help you easily convert AutoCAD designs and objects and Revit designs into presentations, movies, animated and static images to best share and explain your ideas to target audience. AutoCAD Raster Design – is an essential tool for editing, creating, managing and conversion of raster to vector objects. ReCAP – a tool enabling you to capture and render real life data into your AutoCAD projects. 3Ds MAX – an application creating cinematic quality visual presentations to better communicate and sell your ideas. Revit – is a set of BIM tools to perform best architectural designs, constructing MEP networks. Navisworks Manage – is a tool allowing you to facilitate data integration from various sources to ensure better collaboration on the project and to meet delivery terms. Mind that Autodesk Building Design Suite Ultimate 2016 does not offer Naviswork Simulate. Inventor – is a 3D software for visualization and documentation of projects for technical designers to project building components. Robot Structural Analysis Professional – is a tool ensuring ultimate analysis for investigation behavior of a designed project with certain environmental and internal conditions simulated. This allows to explore stability of a building. 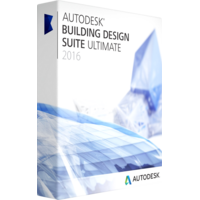 Why to get Autodesk Building Design Suite Ultimate 2016? The Suite includes the essential components providing you a comprehensive set of tools for full cycle design production. The components allow you to import and export the projects and certain objects from one environment to another. Using cloud service will allow you to get access to your projects wherever you are and whenever you need. Autodesk Building Design Suite Ultimate 2016 is a cheaper solution than subscribing to every application in particular. Getting the Suite saves time and efforts on getting all the components separately. Moreover, the Suite is compiled in a perfect way ensuring that all components are essential and usable for you.